From the confusion created around misconceived monitoring strategies to all the social listening tools guidelines available online, we’ve created a list with 9 brand monitoring myths that need to disappear. We’ve separated the myths from the facts, we scooped for the most commonly used ones and we put all the brand monitoring myths on paper. The truth is that Facebook Insights, LinkedIn Analytics, Twitter Analytics, Google Analytics, etc. provide some information, but not enough. Social media analytics have lots of limitations. They can show your social data as long as you have an account on one of those social networks. And it can be pretty difficult to track all of your brand mentions because it offers insights only for your business profile, not everything that happens in the digital marketing area. You’ll need help from brand monitoring tools that use social media intelligence because businesses require more sophisticated information than the one provided by social media networks’ native analytics tools. 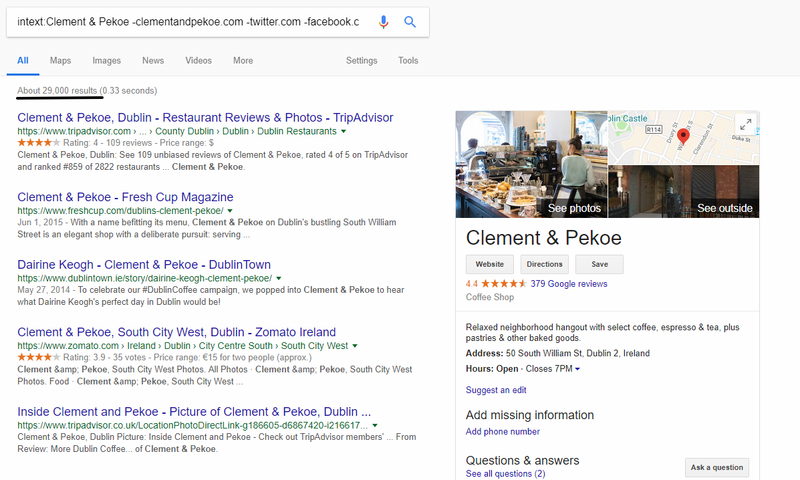 Looking through Google search might offer you some conversations about your brand, but the results might be very limited and overwhelming. What about review websites or blogs? They might not be covered. It is very hard to look through all the results. Just take a look at the screenshot below. There are 29,000 results. 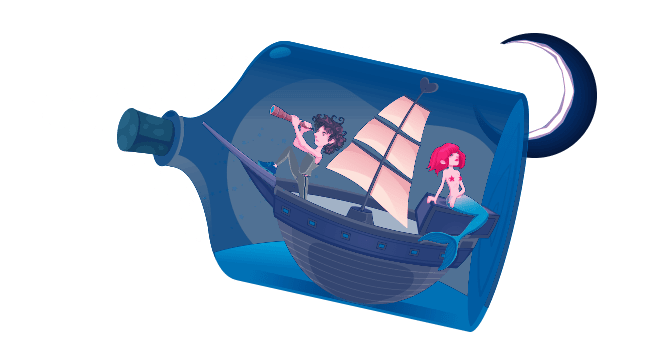 In case you received a review from blogs that write lots of reviews and rank each day on different products or services, you won’t be able to see it in time through a Google search because of all the cluttered information. Searching your brand on Google is like looking for a needle in a haystack. 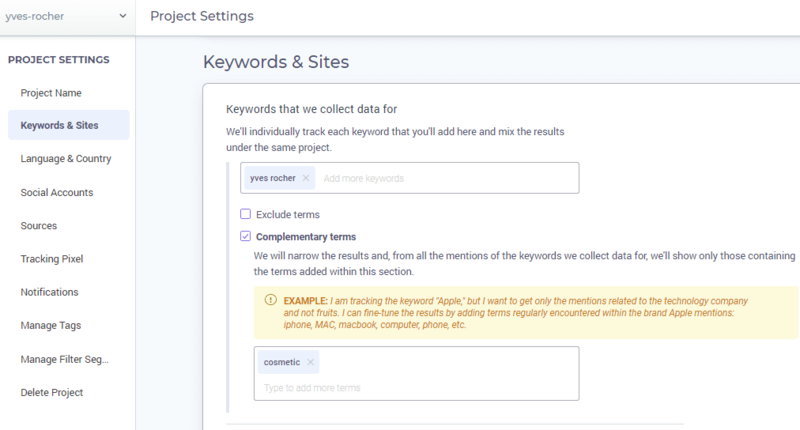 The search results can limit your overall idea, just like in the case of the native analytics tools of social platforms, and it can't show you information from various channels. Google’s algorithms step in and influence the rankings. On SERP you will see just a small amount of mentions and only those that come from websites that rank. Not to mention, the results you see might not be relevant. Relying just on Google to search for your brand is a rookie mistake that will cost you. There are people who believe social media listening doesn’t bring any return on investment. And then there are those who say there’s no possible way to measure ROI on social activities. They are both wrong. And I’ll explain why. Starting with the first situation, you might know that people talk on social media and they share information so quickly that it is hard to keep track of what everybody is saying. Imagine that somebody is saying something bad about your product, and gives a bad review. That person has close friends and they might see the review. It is very easy, in that situation, for people to badmouth your brand. 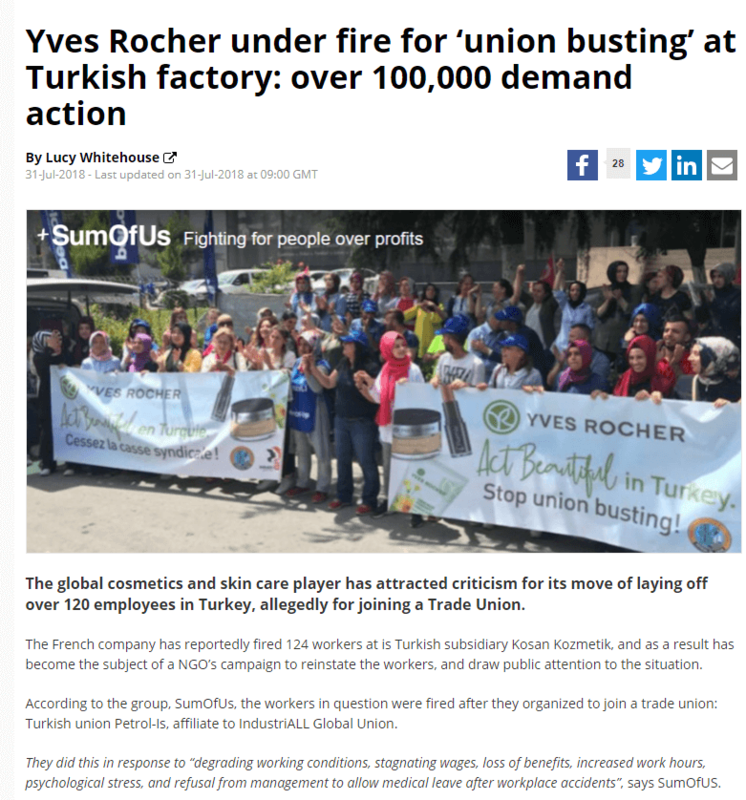 Yves Rocher has encountered a bad situation in Turkey and lots of people and news websites have written about this. Below is a screenshot for one of the articles with an example of a negative mention. Having a social media listening strategy will make it easier for you to evaluate the situation of your brand and know all the time what people say about you. Being prepared will give you the advantage to take actions in case people say bad things about you and thank those who appreciate you. Following the second myth, people who say you can’t measure ROI on social activities they probably don’t know how to do this yet. To measure the results, you’ll have to align your social media goals with your business objectives. Find new leads. Spot any social posts or questions where people ask about different types of product or services, that you can provide. Perform better pitching. Reading what people talk and the conversation they have helps businesses to understand their behavior. Answer to bad reviews. If you are aware of your customer experiences and the people who have complaints, you can resolve them. Find influencers. By looking on Social Media you can see clearly who has high engagement, lots of tracking to their posts and find people with a higher voice. We've said it and showed it before. Social media listening weights a lot of value and it can even increase sales. 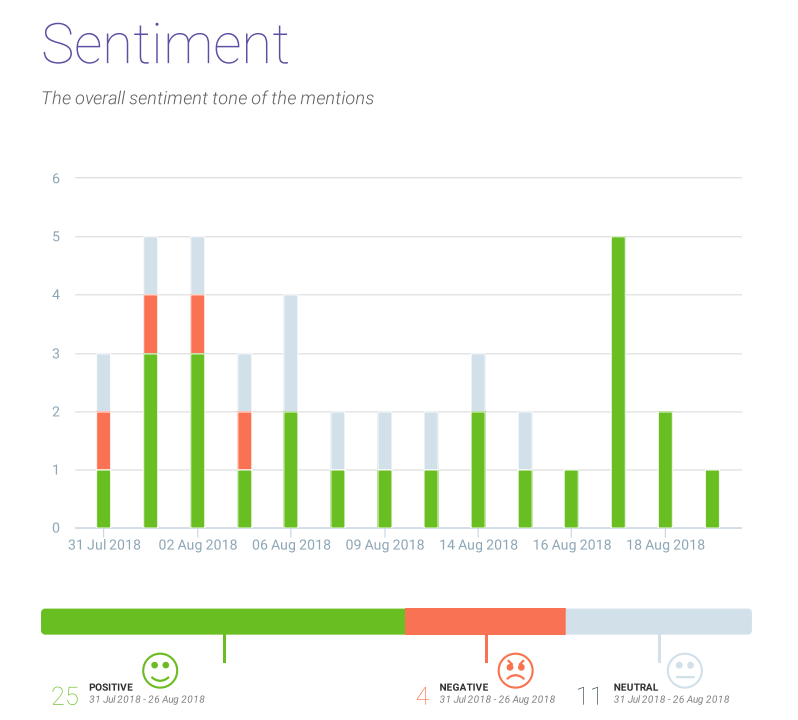 Since previously we've talked about the possibility to track sentiment analysis in BrandMentions, it was only fair to discuss another myth: sentiment analysis is a waste of time. Relying only on sentiment analysis to make an analysis is wrong, but having guidance to understand the audience's opinion about your brand is a plus. The sentiment analysis should be used as a complementary action to find out more and create a more complex picture of how your product is perceived by your audience. You can assure better customer care if you are aware of the problems. It leads you to create better content marketing strategies to offer what your customers need. In case of a crisis management, brand monitoring is essential. The truth is that having a tool that doesn’t provide sentiment analysis is a waste of time. What a deceitful thinking … From all the social media monitoring myths, this one is the saddest. Social listening doesn’t target only the marketing team, it is connected with the whole business. There can be a little doubt because of the name - social - but don’t be narrow-minded. Sales, where you could use the information from the brand monitoring software to spot leads and check the engagement level. Human resources, where you could focus on finding candidates suited to your business. Customer service, where you could track mentions and try to solve different issues and ensure good communication with your customers. Top management for having the true picture of people’s opinion on brand for accurate decisions and investments. Google Alert worked fine a few years ago, but that's not the case today. The tool started to offer incomplete data and cluttered information, which one might not need. As for the paid brand monitoring tools, they offer more flexibility and filtering options that allow you to see accurate data. Like BrandMentions does. You can perform specific keyword researches and add complementary data to narrow the reports and get only the information you need. If you have a business in the US, that doesn’t mean the English language is the only one you should look after. You need to find out what everybody is saying about you; you might never know how valuable mentions in other languages are. Having broader brand mentions spreading means you are known on a wider market and that it will get you awareness. Even if you don’t understand all the languages for your mentions you can use Google Translate to have an idea about the topic. By using media monitoring softwares, you’ll ease up the process and focus on what’s important. Finding the right tool for brand monitoring doesn't have to be a struggle. The best tools aren't necessary the most expensive ones. What is important is that they are suitable for your needs. Of course, there are lots of expensive monitoring tools, but the social media market offers you valuable solutions for every budget. There are great options out there that have awesome features you could use to spice up the research. Not to mention that time is money. And the more time you spend on manually finding your mentions, the more money you spend. Why losing time&money on manually finding and curating tons of mentions when a tool can do all that for you? One of the frequently asked questions from the digital world is: Is it hard to use monitoring tools? Not at all. Most of the times, media monitoring tools are very intuitive and easy to use. Ease of use makes the difference between a tool you’ll love to use, and one that’s a chore. The internet is a place where you can learn lots of things, with every click you make. You can find lots of tools that can help you in brand management offering new insights about your brand and your competitors by performing competitor analysis. Above we've tackled the most common social media monitoring myths, but there are lots of them growing through people’s believes and lack of knowledge. I guess the best way to start learning something is knowing the myths. It is also helpful in the process of learning how social listening works. That way, you’ll know from the start what’s wrong and avoid learning something that will block you from implementing the best business strategy for you. Andreea Sauciuc Andreea is an enthusiastic Copywriter @BrandMentions who has a love for creativity and writing. When she is not watching for the 10th time the TV series Friends, she enjoys a good book and a glass of rose wine. She likes to see life from different angles (and cities). Motto: Eat, think and travel often.